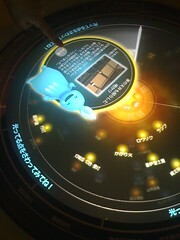 On Sunday I was over in Toyosu and decided to pop into the Tokyo Gas Science museum. I animated the exhibit a few years ago so I was curious to see if it had changed at all. Surprisingly nothing had gone, actually there were a couple of additions. 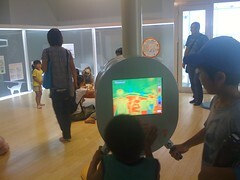 The exhibits are targeted to give children a hands on knowledge of gas and energy information, but adults seem just as interested in the subjects as well. And like almost everything else in Japan it is packaged with cute characters to make it appealing, thankfully so or I would be out of a job. Unlike my other character work which has cute factor only like Tokyo Police's Pipo-kun these characters seem to add (a little) meaning to the exhibit. Each character represents energy states so children can visualize the concept of energy. By using touchscreens, AR interactive games and infrared cameras. It explains how we use gas in our lives and how we should conserve this limited commodity. 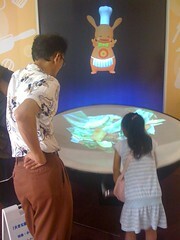 Hands on things like cooking classes and science experiments make the museum quite a good day out for children. There are many interesting examples of the history of energy and future technologies like fuel cells wind and solar power. The most surprising thing for me was how my work had been reused so many times. Unfortunately with entirely different dialogues which meant lips were out of sync. On the upside the kids couldn't care less so I suppose it's just me being fussy. Considering the animation was made over the space of a few weeks Tokyo Gas really got it's monies worth. Looking back now I know why I was told to DELETE much of the mouth detail, not only to save time but so it could be reused over and over! Some trivia, the original versions I made of the characters I made to look like towel and furry stuffed toys.A couple of years ago, fur wasn't being rendered very much so I really wanted to use my new software. I was told there was not enough budget for the soft look, oh well. Restricted again by the bean counters! 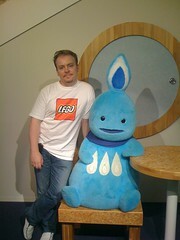 Personally I really wished that went with the plush toy look - oh well. 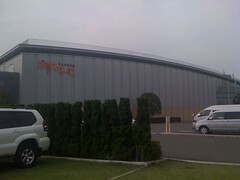 Once more the entire Sadogatake(佐渡ヶ嶽部屋) Sumo(相撲) team over the backyard. 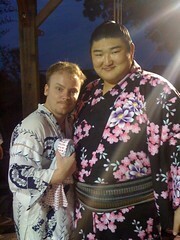 This year we tried to restrict to sumo / family / close clients only. Guest numbers more than halved this year so it was much more easy to handle (wish you guys were here to help this year Will & Andy). 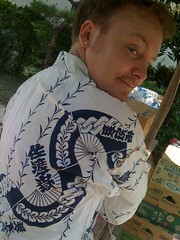 Feeding and partying with a whole Sumo team and over and guests is hard work, here's a shot of me loading the crates. 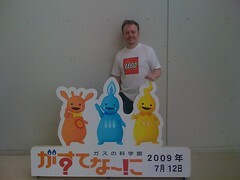 Here is me, the little guy partying with giants. 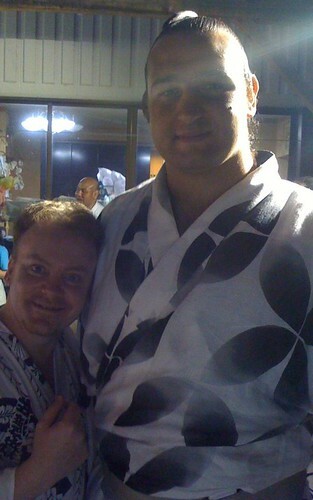 After everyone is fed literally a truckload of meat (Kagoshima kuroge wagyu) and crate loads of beer its time for my pics with these humongous guys. standing beside them will give you the scale of these giants. Thanks Chie, Takako, and Kako for taking my pics. Really have thank Moana this year for helping oniichan Bernie with the drinks! More pics on my private site. some pics from previous years here and here. Tried to kid myself I was researching some physics behind Ponyo. The air builds up and is pushed further and further down the pipes until bubbles are expelled. To satisfy the Second Law of Thermodynamics, heat is expelled from the engine via these ejected pulses. When in reality everyone knows I just was just playing with the pop pop boat in a tub. 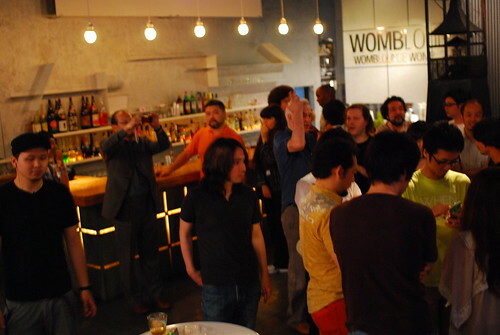 I held the eighth TokyoGAF party at club Womb in Dogenzaka this time. A spectacular night with good friends and some new faces representing Tokyo's leading Game, Film, and Animation companies. I usually give people 2 weeks notice so I honestly thought attendance would be sparse with only 5 days notice given. 37 attended and it felt like just a perfect sized crowd. 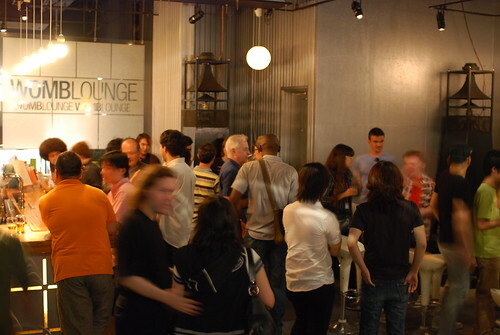 Remember if you are a member on our TokyoGAF site please send me some feedback so I can make the next event even more fantastic. **both images taken by T. Hiramatsu used with his permission. We had a very special guest over from Digital Domain who was not here on official business but was kind enough to make his way to my gig. 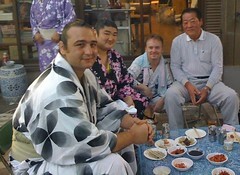 He commented on how important such social events are in LA, and is happy we are doing the same in Tokyo. Judging by peoples comments after the party Jun is truly one of the most respected exports from this country. After the party 4 of us got right blotto in a Latin dance club, animators on the bongos and lots of fun. If you want to attend the next party or know someone who should be our guest join the site and contact me please.